The FAA has prepared an Environmental Assessment (EA) in accordance with the National Environmental Policy Act (42 U.S.C. §4321 et seq.) and FAA Order 1050.1E to document the potential environmental effects associated with the optimization of aircraft routes and the supporting airspace management structure serving aircraft operating under instrument flight rules (IFR) while departing from or arriving to the Southern California Metroplex area. The FAA signed a Finding of No Significant Impact and Record of Decision (FONSI/ROD) for the Project on August 31, 2016. The FONSI/ROD documents the FAA’s decision to proceed with the preferred alternative detailed in the Final EA. The EA and FONSI/ROD as well as other related documents can be accessed using the links to the left. Please use the navigation bar on the left to access important information on the FONSI/ROD and Final EA, including documentation, details on the public participation process for the EA, and supplemental information. The FAA has prepared files depicting the SoCal Metroplex project alternatives and noise analysis results in Google Earth format. The files can be found here. 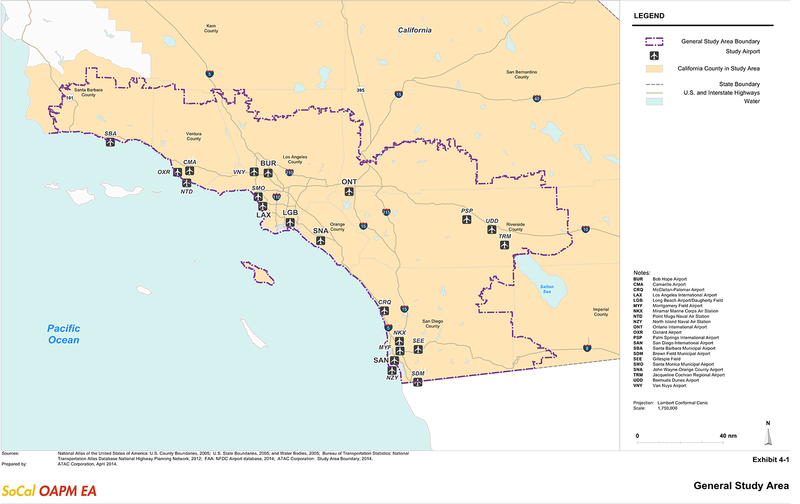 The Draft EA for the SoCal Metroplex project was released and made available for public review and comment beginning on Wednesday, June 10, 2015. The public comment period ended on Thursday, October 8, 2015. The public comment period is closed. 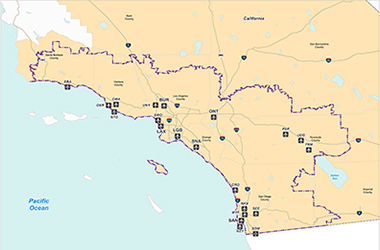 Eleven public workshops were held throughout the SoCal Metroplex General Study Area between June 16 and July 1, 2015. During the workshops, representatives from the FAA and its Consultant Team were available to answer questions about the project. Materials presented to the public during the public workshops are available here for download. After considering public comments on the Draft EA, the FAA prepared a Final EA and signed a Finding of No Significant Impact and Record of Decision (FONSI/ROD) for the Project on August 31, 2016. The Final EA and FONSI/ROD documentation was posted on the website September 2, 2016. The FAA plans to begin working immediately toward phasing in use of the procedures, starting in November 2016 and continuing through April 2017. Before publishing the procedures, the agency will conduct additional public outreach to further inform people about the changes. Specific information for additional public outreach will be announced on the FAA’s NextGen Community Engagement webpage for the SoCal Metroplex project (https://www.faa.gov/nextgen/communityengagement/socal/) as the information becomes available. The SoCal Project would improve the efficiency of airspace in the Southern California Metroplex by optimizing aircraft arrival and departure procedures at Bob Hope (Burbank) Airport (BUR), Camarillo Airport (CMA), McClellan-Palomar Airport (Carlsbad) (CRQ), Fullerton Municipal Airport (FUL), Los Angeles International Airport (LAX), Long Beach Airport (Daugherty Field) (LGB), Camp Pendleton MCAS (Munn Field) Airport (NFG), Point Mugu Naval Air Station (NTD), North Island Naval Air Station (NZY), Ontario International Airport (ONT), Oxnard Airport (OXR), Palm Springs International Airport (PSP), San Diego International Airport (SAN), Santa Barbara Municipal Airport (SBA), Brown Field Municipal Airport (SDM), Santa Monica Municipal Airport (SMO), John Wayne-Orange County Airport (SNA), Jacqueline Cochran Regional Airport (TRM), Bermuda Dunes (UDD), Miramar Marine Corps Air Station (NKX) and Van Nuys Airport (VNY). The Project may involve changes in aircraft flight paths and altitudes in certain areas, but would not result in any ground disturbance or increase the number of aircraft operations within the Southern California airspace. People living and working around LAX might experience unexpected air traffic operations during 0530 thru 1030 on Tuesday September 19, 2017. This will occur as we validate some of the new air traffic routes that are part of our Southern California Metroplex project. On September 19, 2017, LAX will operate in the usual nighttime configuration from midnight to 0530 A.M. Then it will switch to the east configuration from 0530 A.M. until approximately 1030 A.M. In the east configuration, which is typically used during Santa Ana wind conditions; aircraft arrive from over the ocean and depart to the east.